Daniel Rosenthal, author of The National Theatre Story, the definitive new history of the National Theatre of Great Britain, looks back at the original productions of ten of its most celebrated shows, as featured in Great Performances: 50 Years on Stage, airing Friday, February 14 at 9 pm. Enter to win a copy of Rosenthal’s The National Theatre Story (2014, 800 pgs) through the Great Performances giveaway contest, now through February 17, 2014. 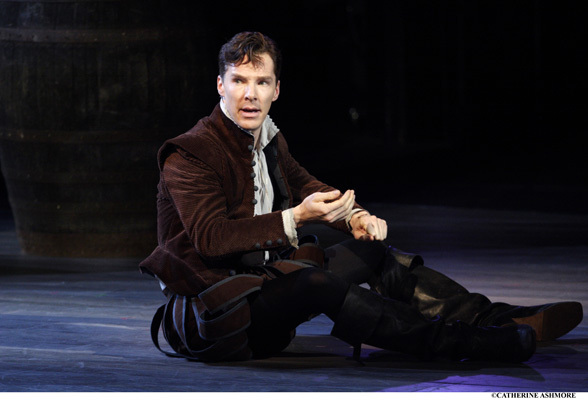 BENEDICT CUMBERBATCH as Rosencrantz in Rosencrantz and Guildenstern Are Dead by Tom Stoppard, in 50 Years on Stage. Merrick secured the rights and Goldby recreated his staging that fall at the 1,400-seat Alvin Theatre (now the Neil Simon), with Brian Murray and John Wood as the title characters. The New York Times’ Clive Barnes greeted “a most remarkable and thrilling play”, which went on to win Tonys for Best Play, Producer and Set and Costume Design. Outside the Alvin, a few days after the opening, a woman had asked Stoppard, then aged 30, what his play was about. SIR MICHAEL GAMBON as Hirst and SIR DEREK JACOBI as Spooner in Harold Pinter’s No Man's Land. Photo Catherine Ashmore. 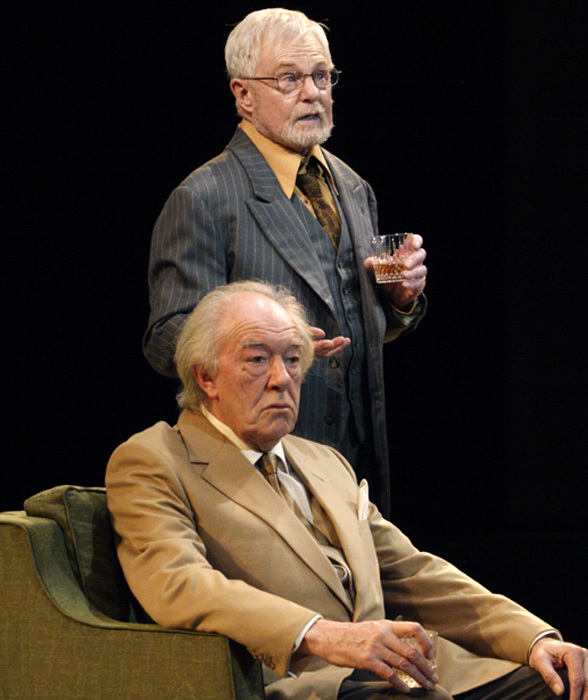 In the 50 Years on Stage segment featuring Harold Pinter’s play, Michael Gambon and Derek Jacobi take on roles originated by Ralph Richardson and John Gielgud at the Old Vic: Hirst, a writer who spends a drunken evening in his London home with Spooner, who claims also to be a successful writer – and to have seduced Hirst’s wife. In 1975 at the Old Vic, where No Man’s Land was directed by Peter Hall, Gielgud “dried up stone dead” during the final preview, while delivering Spooner’s ingratiating, two-and-a-half-page monologue, in which he applies to become Hirst’s secretary. Gielgud Ralph, is that you? Richardson Johnny, is that you? Hall Look, it’s neither – it’s a pause. 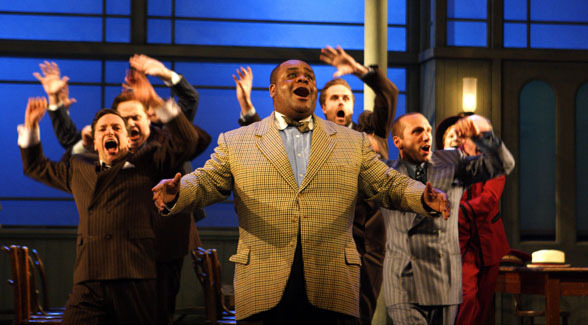 CLIVE ROWE as Nicely-Nicely in the musical Guys and Dolls in 50 Years on Stage. Photo by Catherine Ashmore. In 1982, Richard Eyre’s multi-award-winning Olivier Theatre revival of Frank Loesser, Abe Burrows and Jo Swerling’s “musical fable of Broadway” became the biggest hit of the National’s first 20 years. “I had to see [Guys and Dolls] to believe the raves,” Rex Reed informed readers of the New York Daily News. Reed wondered what had overcome British theatergoers “notorious for their annoying reserve”, as he watched David Healy, as Nicely-Nicely Johnson, reprise “Sit Down, You’re Rockin’ The Boat” seven times before audience cries of “More!” were finally silenced. In 50 Years on Stage, this song is performed by Clive Rowe, who first played Nicely-Nicely when Eyre revived his production at the National Theatre in 1996. RALPH FIENNES as Lambert Le Roux in Pravda in 50 Years on Stage. Photo by Catherine Ashmore. 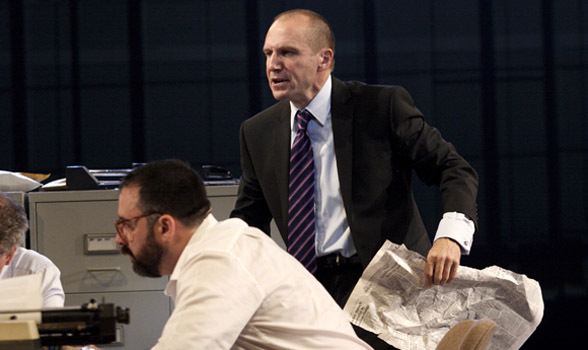 In the 50 Years on Stage segments from David Hare and Howard Brenton’s comedy about British newspapers, Pravda, Ralph Fiennes portrays amoral, rapacious South African media tycoon Lambert Le Roux. In Hare’s Olivier Theatre production in 1985, this ingenious tyrant was played by Anthony Hopkins, who, one day during rehearsals, had asked his director’s permission to “do Lambert as Hitler”, having played the Führer in a TV film. Hopkins stormed up and down, with ranting German intonation and some of Hitler’s gestures, one of which Brenton was thrilled to see retained on stage in the Olivier: “Whenever Le Roux fired someone, Tony kept one thing from that rehearsal: left hand gripping his right upper arm, then sticking his right thumb in the person’s face.” Hopkins gave Le Roux an eccentric posture: leaning forwards in repose and in motion, usually on tiptoes, his neck and back precisely angled to match the gait of an American TV producer whom Hopkins knew well. Le Roux’s lizard-like tongue – constantly darting in and out – was an exaggerated detail from Hopkins’ much-practised impersonation of Laurence Olivier. DOMINIC COOPER and ANDREW SCOTT in Angels in America in 50 Years on Stage. Photo by Catherine Ashmore. 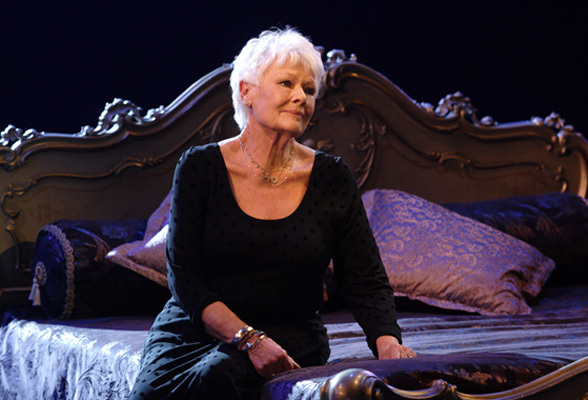 DAME JUDI DENCH as Desirée Armfeldt, singing ‘Send in the Clowns’ in A Little Night Music. Photo by Catherine Ashmore. “Send in the Clowns” helped Dench to earn an unprecedented double, taking the Olivier award for Best Actress in a Musical in the same year as the prize for Best Actress in a Play, which she won for playing a London drinking club hostess in Rodney Ackland’s Absolute Hell, also at the National. (Left to right) DOMINIC COOPER, SACHA DHAWAN, JAMES CORDEN and PHILIP CORREIA in The History Boys by Alan Bennett in 50 Years on Stage. Photo by Catherine Ashmore. Since 1990, the National Theatre collaboration between playwright Alan Bennett and director Nicholas Hytner has been enormously successful, and The History Boys, in which an eccentric schoolteacher, Hector (Richard Griffiths in the original production; Bennett himself for 50 Years on Stage), helps the eight title characters to win places at Oxford or Cambridge universities, remains their biggest hit. However, when Hytner read a first draft of The History Boys in October 2003, a few months after taking over as NT Director, he was “dazzled by its wit and erudition, and by the urgency of its discussion of the purpose of education and the nature of historical truth”, but thought it might run for “only 70 or 80 performances” at the National, where his production would open the following spring. He had massively underestimated its appeal. The History Boys National Theatre, West End and Broadway seasons, and several tours, took its total theatrical audience to around 800,000. When it claimed six Tonys in Play categories it equalled a haul established in 1949 by Death of Salesman. 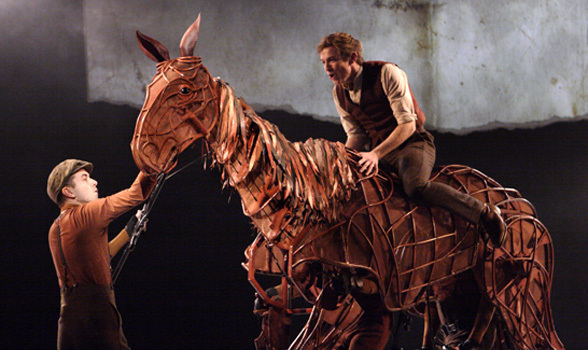 JACK HOLDEN as Albert in War Horse, with TOBY OLIÈ, THOMAS WILTON and MICHAEL BRETT as Joey, in 50 Years on Stage. Photo by Catherine Ashmore. The 50 Years on Stage segment presents one of the show’s many indelible spectacles: the moment, from the end of Scene Three, when ‘at the top of his rearing up, young Joey makes way for grown Joey’; the smaller horse puppet vanishes and the full-sized horse puppet emerges from the upstage darkness. Hytner, heading down from the fourth-floor NT Director’s office to his car on weekday evenings, sometimes sneaks into the back of the Olivier stalls to check on the audience for whatever was playing; once War Horse had opened in 2007, he started timing this detour to coincide with the collective gasp from 1,100 people at Joey’s Scene Three transformation. In late 2006, Steve Wright, a forklift truck driver who lived in London Road, Ipswich, in eastern England, murdered five young women who were working as prostitutes in the area. In February 2008 he was imprisoned for life. This horrific case generated one of the most original productions the National Theatre has ever staged: the verbatim musical London Road. Alecky Blythe’s interviews with residents of London Road, the Ipswich street where Wright had lived, and other people involved in the case, were set to music by composer Adam Cork and – as the Great Performances segment, featuring original cast members, vividly demonstrates – sung and spoken with all of the repetitions and hesitations of everyday discourse retained. Originally staged by Rufus Norris in the Cottesloe, London Road won the Critics’ Circle prize for Best Musical. Norris, who will take over from Hytner as National Theatre Director in April 2015, is soon to turn it into a feature film. The National Theatre Story (2014) by Daniel Rosenthal covers 50 years of the theater's illustrious history. 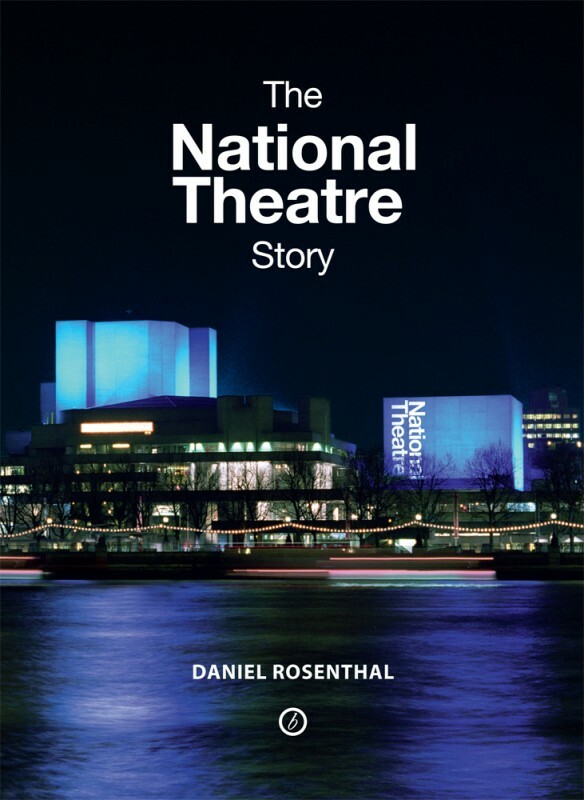 The National Theatre Story (2014; 800 pages with illustrations) by Daniel Rosenthal is published in hardback by Oberon Books and distributed by Theatre Communications Group in the United States.